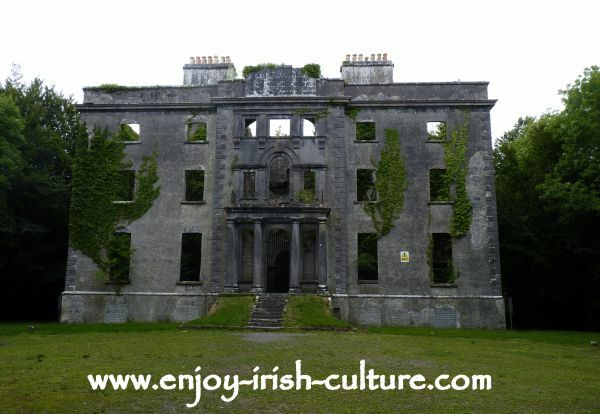 Compared to most other Irish big houses, the history of Moore Hall in County Mayo is exceptional. Moore Hall was built by George Moore (1727-1799) between 1792 and 1796. George Moore (1727-1799) was a wine merchant who owned a fleet of ships and had made a vast fortune in Spain. He came from a Protestant family but George himself was Catholic. Originally from County Mayo and having gone into exile to Spain because of the restrictive Irish Penal Laws, George wanted to retire in Ireland. He sold up in Spain and managed to purchase lands around Lough Carra, benefitting from a relaxing in the Penal Laws at this time. He took an oath of allegiance to the English crown so that he would be able to have tenants on his land to generate some income. The house, Moore Hall itself, was a status symbol for a man of his means as well as a fulfillment of a longstanding dream. Moore Hall was of architectural significance having been designed by the architect John Roberts who also designed Waterford Cathedral and Tyrone House in Galway. It was decorated with beautiful Italian plasterwork, traces of which can still be seen in the ruin of the house today if you look carefully. George had a certain design in mind- he wanted the house to overlook Lough Carra. Although he owned land in more than one location around the lake, the local story goes that he chose to ignore advice warning him that his chosen hill side site was unlucky because of events here in ancient history which involved the killing of a Druid around 400 A.D. The Moore family went on to produce some eminent members whose names were to write history. Moore Hall provided employment for locals and became important in the local economy here as big houses needed many servants. The Moore family were liked by the locals. But the family also seemed to suffer more than a fair share of ill luck after settling here on the shores of Lough Carra. George Moore himself died prematurely age 70 having gone blind after an earlier stroke. His son John Moore (1767-1799) died within a month of him aged 32. John Moore was a lawyer and an Irish Nationalist. 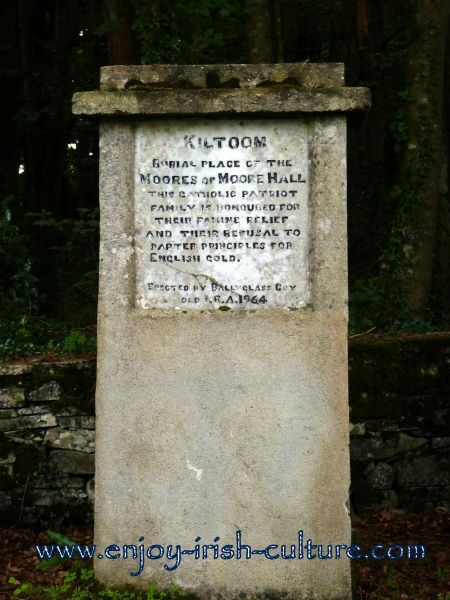 He joined the French troops who invaded Ireland at Killalla in 1798 and was made the first ‘President of Connaucht’. When the rebellion was quashed, he was arrested and sentenced to death. His father spent a fortune on legal expenses defending him in the courts as a result of which his sentence was reduced to deportation. One can only imagine the agony and stress George must have gone through leading to a premature death. In the end, a month after his fathers’ death, John died in captivity while awaiting deportation having been maltreated. His grave was unknown. It was eventually discovered by chance in 1960 in a grave yard in the South East. As a national hero, his remains were exhumed and buried with full military honours in his home county of Mayo in 1962. George Henry Moore (1810 - 1870) who had a strong interest in horses and racing was to become a hero during the Irish famine when he used winnings from horse racing to feed his tenants with corn, and to supply them with cows. Mayo was one of the counties worst affected by the famine, but all of the tenants at the Moore estate survived as a result of his actions. Maurice George Moore (1854 - 1939) became a statesman and humanitarian. He was a colonel and a senator. He served with the Connaucht Rangers in Africa and became the first envoy to South Africa. George Augustus Moore (1852 - 1933) was a well-known novelist and writer who mixed with all the famous literary people of his time, such as Oscar Wilde, Lady Gregory, and W.B. Yeats. He was one of the founders of thee Abbey Theatre in Dublin. It was George Augustus Moore who was present at the property on the night that armed men unknown to him demanded the keys to the big house to set explosives and burn the house down. This anti-treaty band considered the fact that colonel Maurice Moore had taken a pro-treaty stance enough of a reason to justify their actions. The lads mustn’t have done their research on the family history, or maybe they didn’t care anyway. On February 1st 1923, in the throws of the Civil War, Moore Hall became one of 199 big houses that fell victim to the conflicts. 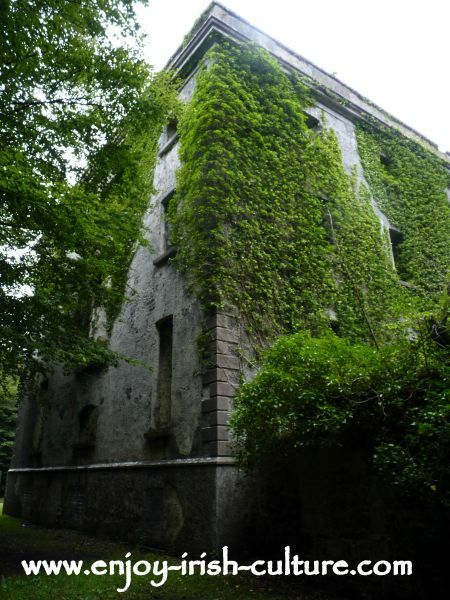 The loss of Moore Hall was the loss of a huge piece of Irish history- the loss of the Irish home of the first president of an Irish republic, the loss of the home of an important poet and novelist, the loss of the home of an unusual humanitarian who saved thousands during the famine, and the loss of an important piece of Irish architecture. George Augustus Moore was heartbroken at the loss of his precious library. In a statement to the press he said: “I could do nothing but stand by with the same feelings that one has standing by the open grave of a very dear friend.” George subsequently emigrated to London, and was later quoted saying that Ireland was not a gentleman's country. 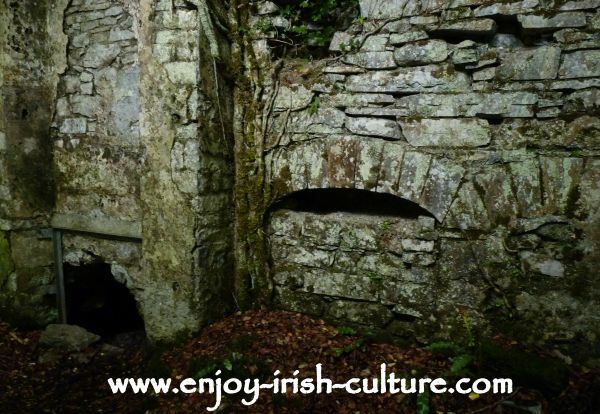 Hi there, hope you enjoyed our article on Moore Hall in County Mayo. If you did, why not tell your friends? There are some easy to use social options, find them at the top right and at the very bottom of all pages. Thanks so much for your support! Warmest regards, Susanna and Colm.